Because of my busy weekend, I did not make any cake this week. (I know, I know, it’s a sad day when I don’t have time for cake!) Thus, this Tuesday I will instead continue with my Weekend Report. I have kind of become my friends’ resident expert on DC (mainly because I’ve been living here for a whole 4 months, and because I have a large capacity for retaining trivial information). In the course of our DC touring, I got to wondering about many things, and thus began researching. 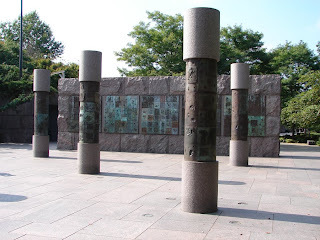 So to enhance your own DC experiences, and impress your friends, I have compiled some fun facts that you probably don’t know about the DC Monuments and the Arlington National Cemetery. - Approximately 20 graveside funerals are held there each day. - The Amphitheater is for special memorial services held on Easter, Memorial Day and Veterans Day. - Arlington House, the former home of Robert E. Lee and his family is located atop a hill, providing one of the best views of Washington, DC (I guess we should have made the effort to walk up the hill). Arlington House is now preserved as a memorial to Robert E. Lee, who helped heal the nation following the Civil War. - Every time a soldier is buried, an Arlington Lady is present. There are about 65 Arlington Ladies, and since 1973, the Arlington Ladies have ensured that no Soldier - old or young - is ever buried alone. - Nearly 5,000 unknowns now resting in Arlington National Cemetery. 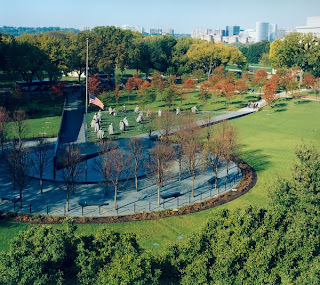 - As of Dec. 7, 1995, there are 1,996 Jewish military service members interred in Arlington National Cemetery. - The Tomb of the Unknowns, aka the Tomb of the Unknown Soldier, overlooks DC, was dedicated in 1921, and contains the remains of soldiers from WWI, WWII, Korea and Vietnam. The tomb is guarded 24 hours a day and each hour (each half-hour in summer) there is a changing of the guard ceremony with a special march and salute. 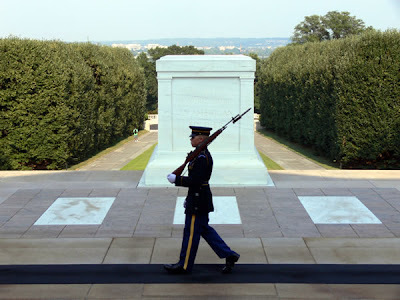 - Sentinels, all volunteers, are considered to be the best of the elite 3rd U.S. Infantry (The Old Guard), headquartered at Fort Myer, Va.
- First, they are tested on their manual of arms, uniform preparation and their walks. Then, the Badge Test is given. The test is 100 randomly selected questions of the 300 items memorized during training on the history of Arlington National Cemetery and the Tomb of the Unknowns. The would-be badge holder must get more than 95 percent correct to succeed. Only 400 Tomb Guard Badges have been awarded since it was created in February 1958. 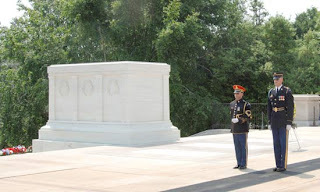 - The Tomb Guard Identification Badge is a temporary award until the badge-holding sentinel has honorably served at the Tomb of the Unknowns for nine months. - There are three reliefs, each having one relief commander and about six sentinels. The three reliefs are divided by height so that those in each guard change ceremony look similar. - An impeccably uniformed relief commander appears on the plaza to announce the Changing of the Guard. - The relief commander conducts a detailed white-glove inspection of the weapon, checking each part of the rifle once. - All three salute the Unknowns who have been symbolically given the Medal of Honor. - The Walk: The Tomb Guard marches 21 steps down the black mat behind the Tomb, turns, faces east for 21 seconds, turns and faces north for 21 seconds, then takes 21 steps down the mat and repeats the process. After the turn, the sentinel executes a sharp "shoulder-arms" movement to place the weapon on the shoulder closest to the visitors to signify that the sentinel stands between the Tomb and any possible threat. Twenty-one was chosen because it symbolizes the highest military honor that can be bestowed -- the 21-gun salute. - An average tour at the tomb is a year. - What is the small green tent next to the tomb for? "The Box" is used primarily during wreath-laying ceremonies for the Sentinel to retreat to while flowers and Taps are being presented. There also is a phone with a direct line downstairs to the Tomb Guard Quarters - this is used in times of emergencies or just to notify the next shift of something. - How many Sentinels have been female? There have been 3 female Sentinels. - Designed by Lawrence Halprin, who also designed Sea Ranch in California, San Francisco's Ghirardelli Square, and the Walter & Elise Haas Promenade in Israel, a 1-1/2 mile stone walkway overlooking the Old City of Jerusalem. - Mr. Halprin's major focus, and one for which he has become famous, is the participation of people in his landscapes. - Since Roosevelt was elected to four terms of office, Halprin created four "rooms" to represent the twelve years of Roosevelt's presidency. - A large fierce waterfall with large blocks of granite scattered around symbolize how the war was tearing the country apart. 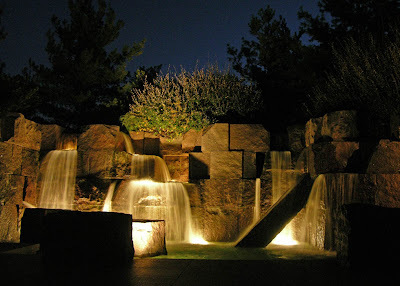 - The waterfalls and reflecting pools representing FDR’s connection with water as his contraction of polio happened after a swim when he was sitting around in the cold (FDR said “water brought me to where I am”, and went to Warm Springs, Georgia to heal himself). - The waterfalls and reflecting pools in each room encourage contemplation and meditation on a turbulent period of American history. - PS - Though it is tempting to take posed pictures with the different figures in the Memorial - RESIST the urge - people find it very offensive and disrespectful! - Kind of ironic that it is modeled after the great Parthenon of Athens – Athens/Ancient Greece was definitely a slave state. - A 164-foot mural wall is inscribed with the words, "Freedom Is Not Free"
- The wall is etched with 2,500 photographic images of nurses, chaplains, crew chiefs, mechanics and other support personnel to symbolize the vast effort that sustained the military operation. - Check out this site to see how the images on the wall are organized by service. 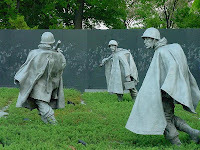 - All of the images look straight out from the wall over the platoon of statues; the soldiers they were there to support. 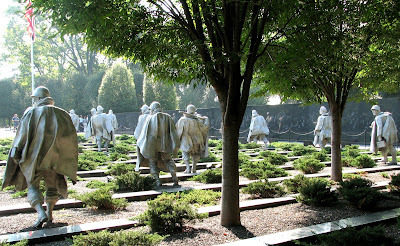 - A platoon of stainless steel soldiers in the "Field of Service" walk through juniper bushes and granite strips, symbolizing the rugged terrain of Korea. - Fifteen of the figures are from the U.S. Army, two are from the Marine Corps, one is a Navy Corpsman, and one is an Air Force Forward Air Observer. - They represent an ethnic cross section of America with 12 Caucasian, 3 African American, 2 Hispanic, 1 Oriental, 1 Indian (Native American). 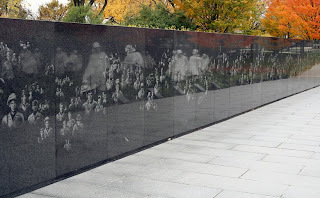 - When reflected in the wall, there appears to be 38 soldiers, representing the 38th parallel (For those of you who don’t know, that is the dividing line between North and South Korea), and the 38 months of the war. - Three of the statues are in the woods, so if you are at the flagpole looking through the troops, you can't tell how many there are, and could be legions emerging from the woods. - The United Nations Wall (very low wall) on the opposite side lists the countries that provided troops, medical support, or supplies to help South Korea. - All these elements point toward the Pool of Remembrance, forming a triangle. - In the south side of the memorial, there are three bushes of the Rose of Sharon hibiscus plant, South Korea's national flower. - You can walk out into the pool area on a peninsula symbolic of Republic of Korea, which is a peninsula.